Lately, I’ve been obsessing over Vietnamese food. Hard. Between planning our month-long journey through Vietnam, constantly rotating between the two amazing Vietnamese cafes near my house, and making my spring rolls as often as possible, I still can’t get enough of anything and everything Vietnamese. So that’s where my herbaceous, flavor-packed bún chay recipe comes into play. And it is so, so satisfying. 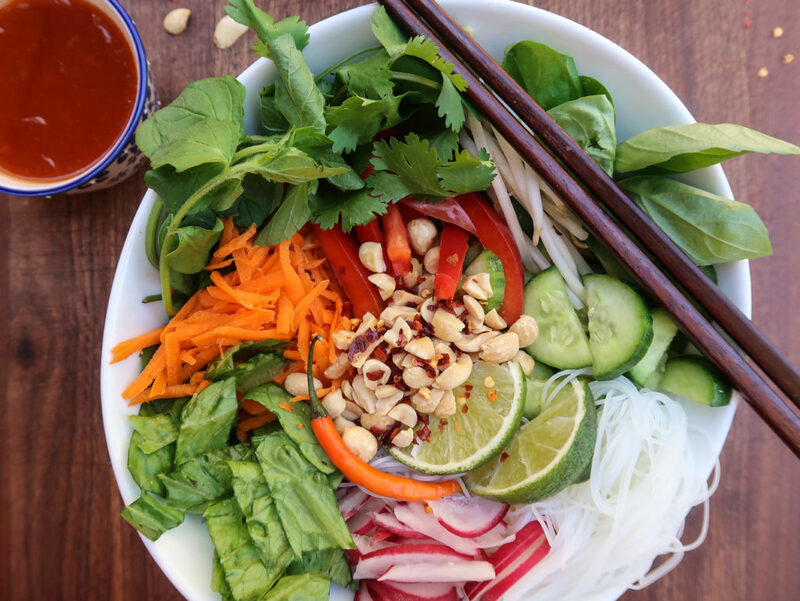 We’re talking about a big bowl of goodness: tender vermicelli noodles, vibrant, raw vegetables, crunchy peanuts, heaps of fresh herbs, and a tangy-salty-spicy dressing. It’s pretty much the most delicious noodle salad you could hope for. If you haven’t met bún chay yet, then it’s time that you two get acquainted. Bún chay is a typical Vietnamese dish usually made up of white rice vermicelli noodles, lots of herbs, veggies, and a tangy dressing. And just so you know, in Vietnemese, bún means noodle, and chay means vegetarian. I don’t even know where to start with this bún chay recipe. I have entirely too many good things to say about it, so I may as well start with the obvious: the ingredients. First of all, it wouldn’t be bún chay without white rice vermicelli noodles, now would it? This bún chay recipe also calls for lots fresh vegetables and herbs. Think carrots, cucumbers, red bell peppers, radishes, bean sprouts, romaine lettuce, basil, mint, and cilantro. Talk about a nutrient-packed meal! And that tangy, spicy, salty dressing? Well, it’s rice vinegar, lime juice, sriracha, freshly grated lemongrass, fish sauce, and sugar. Another thing I love about this bún chay recipe is how fast and easy it is to throw together. It’s just five simple steps. 1) Stir together the dressing. 2) Cook those noodles. 3) Chop up the veggies, herbs, and peanuts. 4) Toss it all together. 5) Enjoy every last morsel. Plus, I always have every single ingredient necessary to make this bún chay recipe in our pantry, fridge, and herb garden. When all else fails, I can count on the fact that my delicious bún chay is never more than thirty minutes away. Bright, fresh, herbaceous, tangy, crunchy, spicy, salty, citrusy, healthy, and oh, so satisfying. These are a few of the words that come to mind when I think about this bún chay recipe. No matter what, I promise that this bún chay recipe won’t disappoint. Perfect for a brunch, lunch, dinner, a summer picnic, or a midnight snack, it really doesn’t matter. It’s delicious any time, day or night. If there’s one thing in life that I’m absolutely sure of, it’s that you are going to love this bún chay recipe. This bún chay recipe couldn't be more healthy or satisfying. 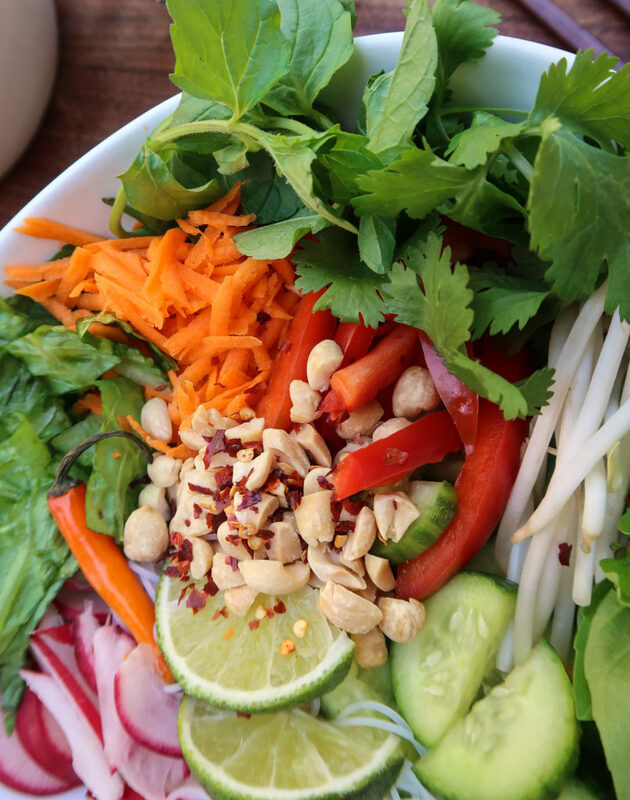 Full of tender noodles, fresh vegetables, vibrant herbs, and a zingy dressing, you will love this Vietnamese noodle salad. It's bright, fresh, tangy, spicy, citrusy, crunchy, herbaceous, and absolutely delicious. Plus, it's quick and easy to make! In a bowl, stir together the rice vinegar, lime juice, sriracha, sugar, lemongrass, and fish sauce. Set aside. Cook noodles according to package instructions. Strain and rinse under cold water until noodles are lukewarm. Prepare the vegetables, herbs, and peanuts. In a bowl, toss together the dressing, noodles, vegetables, herbs, and peanuts. Serve, and if desired, garnish with lime wedges, sriracha, red pepper flakes, and/or extra peanuts. For the dressing, grated lemongrass is optional. For vegan bún chay, omit fish sauce from the dressing and use salt to taste instead. Did you try our bún chay recipe? Let us know what you thought in the comments below. Make sure to tag us in your bún chay photos on social media with @travelalphas so we can see! This post contains affiliate links. If you make a purchase via the links in this article, we will receive a commission, at no extra cost to you. These commissions help keep Travel Alphas up and running, and we thank you for your support! Please see our disclosure for more information. Vietnamese food is so unique. When I got to Vietnam in 2015 I was a bit shocked and had to adjust to the food, so I did not try loads of dishes..which I regretted as soon as I got back home. Oh no! What a bummer… Vietnamese food is incredible. Well at least you tried the bún cha!